With Sync2 Cloud, you can sync Outlook Contacts with iPhone without using iTunes. 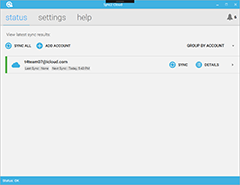 With automatic synchronization you can keep your Outlook Contacts in sync with iPhone at all times. Changes made in one source will be transferred to another. Synchronize one or multiple Outlook accounts with multiple iCloud Contacts and iPhone. Automatic synchronization option lets you keep your Outlook Contacts with iPhone in sync at all times. 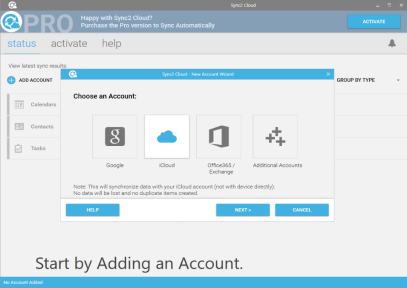 With Sync2 Cloud, you can export contacts from iPhone to Outlook and vice versa. You can add Outlook contacts to iPhone. You can also easily share your contacts with others. Access iCloud and iPhone Contacts in Microsoft Outlook. Click “Finish” and begin synchronization. Note: You will need to enable iCloud synchronization on your iPhone to begin the synchronization. To learn more about how to set up your iPhone with iCloud account click here. In a few moments your Outlook Contacts and iPhone will be synchronized.